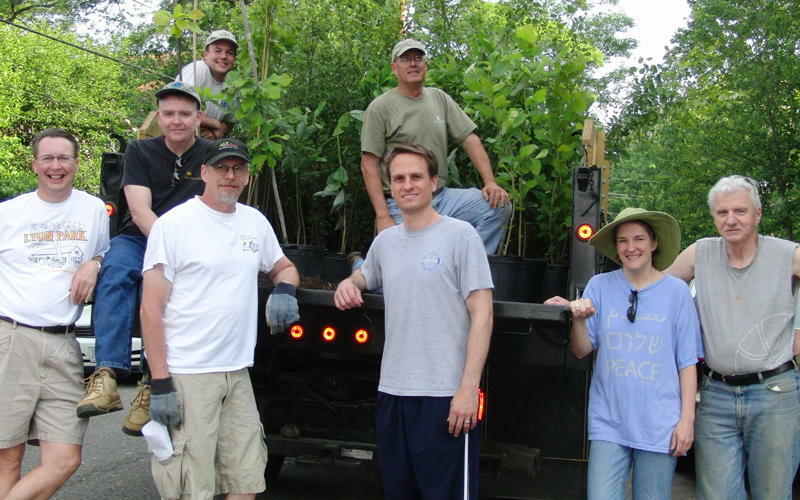 Bill Anhut is in the far left of the photo with other Lyon Park stewards of trees. Patrick Wegeng, Arlington County PRCR staff in charge of the program is in the center, on the truck, smiling. Our mature trees are a community amenity, enhancing property values by making our neighborhood highly desirable. I believe all of us have a duty to be tree stewards during our short time on the planet. Those of us lucky enough to share our yards with these long-time residents of our neighborhoods have a duty to care for, nurture and prolong the lives of these gifts of nature. Our list of to do’s is short. Mature trees are very resilient. All we need to do is (1) protect their roots (2) structurally prune branches to promote outward growth and allow wind to pass through the tree’s crown and (3) be vigilant to protect the tree from invading pests such as insects and English Ivy. Given our relatively small land parcels, tree maintenance cooperation among neighbors is necessary. If a tree’s trunk lies completely within your property line, the tree’s maintenance is your responsibility. Trees straddling property lines become the shared responsibility of each owner. Neighbors should periodically communicate with each other about the maintenance of their trees and freely express any concerns or fears they have for the existing condition of a border tree. Coordinated action is always best to maintain cordial relations with neighbors, however a neighbor has the legal right to trim branches of your tree if they hang over the property line as well as trim encroaching roots. (However the neighbor may not damage the tree). Pruning large and mature trees has a significant cost, but such costs are not elective. They are a mandatory cost of home ownership and should be budgeted every 5-10 years. Periodic pruning is more cost effective than suffering the loss and paying for the removal of a tree damaged during high winds because its branches hadn’t been trimmed for years. Be a good neighbor by being an active advocate for your trees. Don’t procrastinate. Discuss the condition of your trees with your neighbors. Listen to their concerns. Take action by bidding out your tree work to 2 or 3 established tree service companies (with Certified Arborists on staff). Remember that it is our civic duty to maintain healthy trees throughout our wonderful neighborhood. Be a neighborhood Tree Steward!! I welcome questions about yours or neighborhood trees; plant a seed in our suggestion box to the right. This entry was posted in Advocacy, Education and tagged advocacy, tree care. Bookmark the permalink.